Pre Draft Report: Zach Green received a scholarship offer to Oregon State before stepping on a high school diamond. A shortstop in high school he will need to move to third base in either college or the minors. Green flashes above average power at the plate but his swing has a lot of moving parts and Green struggled with plus velocity in show case events. Green has good size, which while causing him to move to third, makes him very projectable. He should be a good defender at the hot corner and he has a above average arm which will play well at this position. By all accounts Green is an extremely hard worker who showed good leadership in high school. Career Synopsis: The Phillies selected Green in the 3rd round and signed him to an above slot bonus. 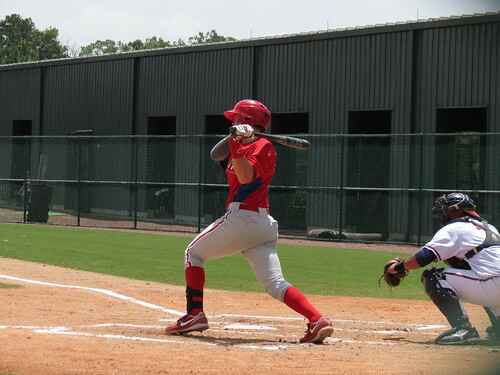 Green made his debut in the GCL where he primarily played third base. At the plate he flashed both plus contact and power rates but his swing had a lot of moving parts and struggled to get going which hurt his contact rate overall as he struck out 43 times in 47 games. He showed good power at the plate ending up with a final line of .284/.333/.426 in 177 PAs. Summary: There is a lot of upside in Green stemming from his big time raw power, at a position, third base, that has become increasingly scarce. The big question is whether he is going to hit. He is really going to need to improve against breaking balls to have a chance. It might be incremental improvements rather than a big breakout, but if he puts it together he could be a really nice player. Summary: Green has played some shortstop professionally but he will be a third basemen long term. Has a former shortstop he is a plus defender at third base with a chance to be plus plus as he gets used to playing the position, his arm at third has been labeled as plus and should play well there. At the plate Green has a good swing but it has a lot to get going but the Phillies will work to quiet it. He flashes plus power but it is hindered by his strike zone judgement. His speed is merely fringe average and will likely drop a notch below as he matures. Upside: Green is an interesting prospect at third base. Moving off shortstop has put more pressure on the bat but he will be a plus defender at third and possibly more as he learns the position. At the plate his swing has some work to be done to smooth it out but he makes good contact and should hit for a good average. He flashes plus power now and has the frame to add more strength going forward. Depending on his spring and that of the third basemen in front of him he could go to Lakewood or stay in Extended Spring before heading up to Williamsport. Either way he will take some time but the payoff could be well worth it.